BMW have been getting it rough recently, with its styling directions being at best ‘controversial’, and yet BMW keep going in the same direction, despite public outcry. This is a great shame, as BMW do make some fine motor cars. The new Z4 coupe will be released in 2006, is a last ditch attempt to revive interest in the Z4, which in its roadster format has certainly not set the world alight, with its “flame surface” styling. The numbers speak for themselves, with production having been cut back from 56,589 to 35,136 in 2004, and in the first five months of 2005, production was cut by another 28 percent. 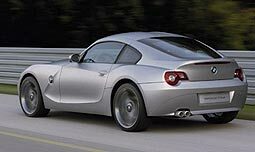 Sources close to BMW say that if the coupe version for 2006 is well received, the next generation Z4 will probably be released with a fixed top. It will also come out with a toned down styling (throwing some cold water on the controversial “flame” styling)! 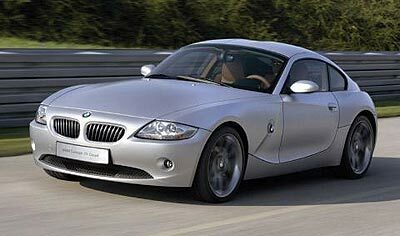 This new Z4 is scheduled for 2009, so it’s going to be a long wait. The new model will also have active steering, adjustable dampers, and the new twin-clutch transmission that is due to replace the sequential M gearbox. With public comments such as those, and dwindling sales, you would imagine that BMW would wake up. Perhaps they have, but they are certainly moving too slowly to stay abreast of world taste. For me, the hard-top looks as if it were made by Fred Flange’s Friendly Fiberglass shop and grafted on. It certainly does look old fashioned, and the Kamm tail is reminiscent of the Aston Martin DB4/DB5 series. At least it does look better than the Z3 coupe which was a disaster. 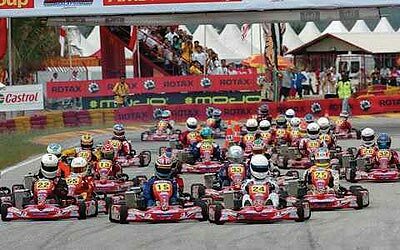 James Grunwell had a great week at the Rotax Go-Kart world championships in Malaysia and after the qualifying rounds was placed 4th on the grid in the final, in a field including the best drivers in the world at that level. There were more than 60 countries represented. Unfortunately in the final he was disadvantaged by his set-up on the drying track and had to settle for 9th place overall. This is best a Thai based driver has ever achieved. Most of the drivers he was competing against had been driving for 10 years compared with only three years for James. It is hoped that this year he might be awarded one of the BMW scholarships to run in the Formula BMW Asia in 2006. James, his parents and I have our fingers crossed. This is a young man with obvious talent. 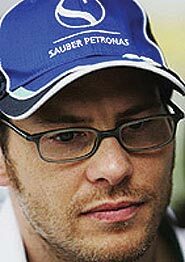 Interesting little press release from BMW to say that Villeneuve is staying at BMW Sauber for 2006. There had been much talk that Villeneuve would get the bullet or the DCM (Don’t Come Monday) when BMW took control over Sauber, with whom Villeneuve had another year of his contract to run. It seems that the contract was still good for 2006 despite Sauber losing control of the team, and even though BMW now has the main say. You can also be sure there were enough contract lawyers looking at the fine print, over in Germany. Well done JV’s manager. The official response from BMW Motorsport Director Mario Theissen was “We took a close look at Jacques’ performance level at the end of last season. After an extremely tough first half of the year - which showed that even a former World Champion cannot come back after a period away and be competitive from day one - he got closer and closer to his team-mate over the second half of the season. We are in no doubt that Jacques will make the BMW Sauber F1 Team stronger.” And if you believe that, you will believe anything. I believe that he was (is) well past his use-by date, and just because he won a world championship while in the best car in 1997 does not mean he would continue at that level. He did not star at BAR, he was passed over by Renault last year and was outshone by Massa in 2005 at Sauber. Remember that the only ‘true’ yardstick is to measure a driver’s performance against his team mate. Villeneuve has been lacking. We will all await 2006 with an air of expectancy? Is the Tweel “weely” the way to the future? In the list of the top 10 significant inventions in 2005, there was one automotive product. The “Tweel” made by Michelin. A few weeks ago I looked at the ‘run flat’ tyre technology systems on a test vehicle, and hoped this was not the way we were heading. The ‘run flat’ system were tyres that basically had a pliable rubber band inside them and that meant the tyre never deflated totally and would always get you home. However, the tyre principle as we currently know it was preserved. 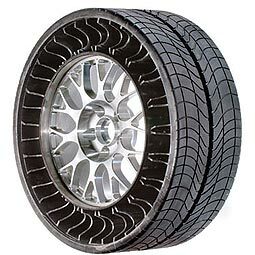 The tyre carcass held air to allow for flexibility, the sidewalls were also important in giving directional stability, while the tread met all the imperfections in the road surface and the rolling resistance was the sum of all three factors. All of the above really now comes out as a very interim step in tyre technology, as Michelin revealed at the Paris Motor Show. This new and exciting concept is the Michelin Tweel. This is, by nature of its airless construction another puncture-proof tyre. The name “Tweel”’ is an amalgamation of “tyre” and “wheel”. It is a non-pneumatic (or airless) wheel, made up of a rubber tread bonded to the hub through flexible spokes. Rather than a wheel plus a demountable tyre, we now have a single combined product called the Tweel. Mounting and removal operations will thus be simpler says Michelin. As the Tweel is extremely strong, they are also working on a range of other applications including smaller earthmover and military vehicles. However, it was not till the North American International Auto Show (NAIAS) that Michelin’s trend-setting technology caught the imagination of the media. “Major revolutions in mobility may come along only once in a hundred years,” said Terry Gettys, president of Michelin Americas Research and Development Center. “But a new century has dawned and Tweel has proven its potential to transform mobility. Tweel enables us to reach levels of performance that quite simply aren’t possible with today’s conventional pneumatic technology.” All this is conveniently forgetting that radial technology is only 50 years old, but never mind! Going back to the basic construction of the Tweel, the spokes which are flexible, mimic the action of the compressed air and sidewalls in delivering the ride comfort. The flexible wheel deforms to absorb road shocks from surface irregularities. Without any air needed by conventional tyres, Tweel has the weight-carrying capacity, ride comfort, and the ability to ride over road hazards. Michelin has also found that it can tune Tweel performances independently of each other, which is a significant change from conventional tyres. This means that vertical stiffness (which primarily affects ride comfort) and lateral stiffness (which affects handling and cornering) can both be optimized, pushing the performance factor for these applications and has the potential for superior performance not possible for current air inflation tyres. Michelin claim it has increased the lateral stiffness by a factor of five, making the prototype very responsive in its handling. According to factory information, the Tweel prototype tested on the Audi A4, is within five percent of the rolling resistance and mass levels of the standard tyre fitment. For Michelin, Tweel is a long-term vision that represents the next step in a long path of industry-changing innovations. Fifty years ago, Michelin invented the radial tyre and Michelin believes that radial tyre technology will continue as the standard, however, Michelin is continuing with its Tweel research. I believe that research will see the radial technology replaced within the next decade. Last week I mentioned that the first roadside petrol pump was installed in the UK in 1913, but another country had installed them long before. The question was which country, and when? It was the USA in 1906. So to this week. Which candle manufacturer also built motor cars? Clue: Agnelli!